In Windows Phone 8.1 the Photo Hub has lost the magazine UI in favor of the traditional WP page view. You get three swipe-able pages - all, albums and favorites - all pretty much self-explanatory. Automatic OneDrive backup is available, you just need to enable it from the settings. Microsoft gives you 7GB for free plus 3GB for the each device on which you turn on the automatic OneDrive camera upload. Sharing options include Bluetooth file transfer, messaging, email, Facebook, OneDrive and other available social services. The default Xbox music player in Windows Phone 8.1 uses the familiar page layout - you get Now Playing page; Collection view with shortcuts to artists, albums, songs, genres, playlists, and Music Store highlights. It also allows you to create, edit and delete playlists straight from your phone. The player is compatible with your Xbox Music account and can stream your songs if you have active connection without saving them on the phone. Unfortunately The Music app doesn't support WAV or FLAC playback. There are no equalizer options either. The video player is a separate app called Video. It has a four-page layout - your collection, movie store, TV store and spotlight. The video player supports XviD, DivX, MOV and MP4 videos up to 1080p resolution. The few things it won't play are MKV files and videos using the AC3 audio codec. There is a limited subtitles support, but you have to put both the video file and subtitles in a separate folder within the default Video folder. There's an FM radio with RDS support on board the Lumia 930. You can use the loudspeaker for the FM radio, though you still need the headset connected as it doubles as an antenna. 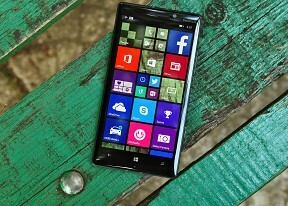 The Nokia Lumia 930 is a not the loudest performer we've seen in our audio quality test. It's about average when connected to an active external amplifier and worse than the average when you plug in a pair of headphones. As far as the clarity of the output is concerned, the Nokia smartphone did well in the first part of our test, posting pretty good scores, although short of some competing flagships. 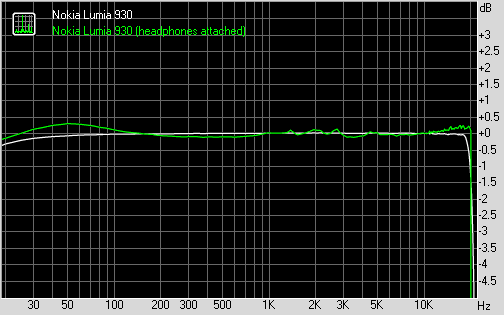 Plugging in a pair of headphones adds a fair amount of stereo crosstalk, and quite a lot of intermodulation distortion for an overall underwhelming performance. These are not the kind of flaws an average user will be able to detect in real use cases, but they might matter to extreme audiophiles armed with overly expensive headphones.